85% Coconut Water sweetened with real coconut pulp. Grace Coconut Water is a thirst quencher offering ultimate hydration. Packaged with the delicate taste of pure coconuts straight from the tree. Hydrate well with Grace Coconut Water. 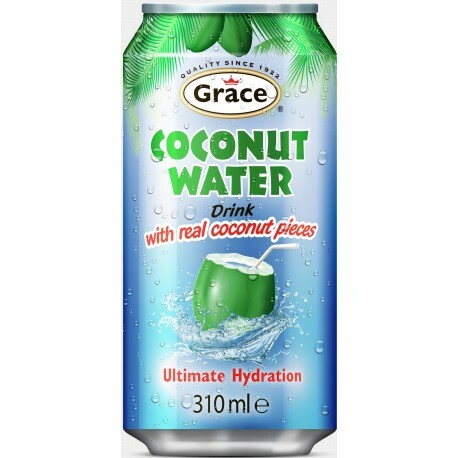 Grace coconut water is a brand of GraceKennedy corporation with coconut water of Caribbean Young Green Coconuts. GraceKennedy is one of the Caribbean's largest and most dynamic corporate entities. The company started in Jamaica in 1922 as a small trading establishment and wharf operators. It has expanded and diversified over the years, changing from a privately-owned enterprise to a public company listed on the stock exchanges of Jamaica, and Trinidad & Tobago. Today, the GraceKennedy Group comprises a varied network of some 60 subsidiaries and associated companies located across the Caribbean and in North and Central America and the United Kingdom (See our organizational chart). Our operations span the areas of food processing and distribution, banking and finance, insurance and remittance services, together with an investment in building materials retailing. In 1995, GraceKennedy developed our 2020 Vision, our objective being to transform ourselves from a Jamaican trading company to a global consumer group with our roots in Jamaica.